Always looking for the cheapest way to do things, I searched several websites that claimed to have cheap international airfare. The cheapest from Traverse City, Michigan to Quito, Ecuador, was $1720. Out of curiosity, I checked Miami to Quito, and it was only $404. Airfare from Traverse City to Miami was $299. Book two separate flights and I could save more than $1000! The discount sites aren't set up to check in this way, so you have to do this on your own. Of course, if your first flight is late and you miss the second, you may not get a refund, so plan some time between flights. In any case, it's still cheaper (every time I checked) to just book a flight to Miami and catch a flight to Quito without a reservation, thus avoiding this problem. This strategy is for those in towns without international airports. If you live in Miami, you already have cheap international airfare. We've found that travel agencies just can't compete with the discount ticket websites. You can search Google ("cheap airfare Europe", for example), or go straight to one of the well-known sites, like Expedia, Travelocity, Cheap Tickets, Hotwire or Priceline. Doing a quick search for the cheapest airfare from Tucson, Arizona, to Buenos Aires, Argentina, using the five sites mentioned, here's what I just found: They ranged from $1221 down to $873 for the lowest fares, with fares as high as $3728. Hotwire happened to be the cheapest, but they were the worst of the five when I searched for a domestic flight earlier. 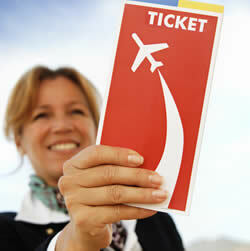 You cannot say which service will find the cheapest international airfare from week to week. My number one money-saving tip is to always check several websites when shopping for inexpensive flights. Courier companies ship things using the luggage space of an aircraft passenger. It can be quicker, cheaper, and more reliable than sending the shipment unaccompanied, since checked luggage bypasses many of the typical customs delays. The company purchases tickets, and then they resells them to you. In exchange for your luggage space, they give you a discount on the airfare. I saved $160 on my plane tickets this way when I went to Ecuador the first time. I had several suitcases full of car parts, but there was a representative of the courier company on either end, and I looked inside the luggage, so I knew what I was carrying. I carried a plane propeller on the return trip, which wasn't much trouble, and made a good story. It's easiest to be an air courier if you travel alone. Ocassionally, a courier company will have opportunities for flights on or near the same date. If not, your travel partner can pay full fare on the same flight. You also are usually allowed carry-on luggage, since the point is for the shipping company to use your checked luggage allowance. Once in a while, air couriers fly internationally for free, and almost always very cheap. It's a matter of how badly the company needs you and how flexible you are (can you fly to London on Friday?). Air courier opportunities are becoming rarer, due to the recent heavier regulation of international flights, but there still are opportunities. Find out more at The Air Courier Association Website (www.aircourier.org). The ACA can also help you get really cheap plane tickets by way of airline ticket wholesalers, discounters, last minute specials, and stand-by travel. When searching the discount websites, try several different departure and return dates if you can. The difference of a day or two can save you a lot. There's little logic to airfare pricing, so don't try too hard to figure it out. Just be aware that if you leave on Friday instead of Wednesday (or vice-versa), you may save $100. Check the boxes that say "any time" for departure and "2 or more connecting flights". Even if you aren't sure that you want to leave at midnight, see what your options are. The savings might change your mind. When search criteria allow you choices, first take the ones that are the least restrictive for the airlines. If the savings aren't enough, you can always book first class, direct flights, or whatever you prefer. Buying your plane tickets two weeks in advance is usually cheaper. There can be a dramatic difference (but not always) if your trip is over thirty days. You may want to cut it from 32 days to 30 to save hundreds of dollars on your fare. Play with the dates. You never know what you might discover. Spend a few minutes or an hour to do some research, if you want really cheap international airfare.